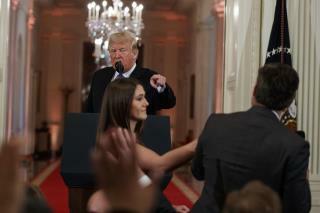 The alteration is "too precise to be an accident"
(Newser) – A video distributed by the Trump administration to support its argument for banning CNN reporter Jim Acosta from the White House appears to have been doctored to make Acosta look more aggressive than he was during an exchange with a White House intern, an independent expert said Thursday. White House press secretary Sarah Sanders tweeted the video, per the AP, which shows Acosta asking President Donald Trump a question on Wednesday as the intern tries to take his microphone away. But a frame-by-frame comparison with an Associated Press video of the same incident shows that the one tweeted by Sanders appears to have been altered to speed up Acosta's arm movement as he touches the intern's arm, according to Abba Shapiro, an independent video producer who examined the footage at AP's request. Earlier, Shapiro noticed that frames in the tweeted video were frozen to slow down the action, allowing it to run the same length as the AP one. The alteration is "too precise to be an accident," said Shapiro. The tweeted video also does not have any audio, which Shapiro said would make it easier to alter. Sanders, who hasn't said where the tweeted video came from, noted that it clearly shows Acosta made contact with the intern. CNN has labeled Sanders' characterization of Acosta's exchange with the intern as a lie. Its position has been supported by witnesses including Reuters White House correspondent Jeff Mason, who was next to Acosta during the news. "The irony of this … is that if it is found to be doctored, it will show the administration to be doing what it accuses the news media of doing—engaging in fake information," said Aly Colon, a professor in journalism ethics. "Looks Doctored???" Give me a break, Newser, you cowards! Check it, Mujambo, the video was OBVIOUSLY DOCTORED by Alex Jones or one of his conservative underling scumbags. Newser, if you are going to 'spin and lie,' then join the Trump cabinet. They're professional liars. They'll show you how to lie ... IN CHURCH! I don't think it is possible to make that narcissist Acosta "look more aggressive than he is". He's a disgrace to the profession.